As commander in chief of the armed forces, the president of the United States bears great responsibility in determining when and how to use military force. To make such decisions, the president requires clear understanding of the risks, costs, and likely outcome of a military intervention. Because many presidents and senior civilian appointees lack military experience, they rely on senior military advisors to provide viable, realistic, and timely advice to inform critical decisions. Unfortunately, what the military leadership provides is often not what presidents are looking for. Whereas civilians expect a collaborative dialogue in which multiple options are presented to them over a short period of time, military officers are taught to deliver their “best military advice” only after developing a detailed plan. Developing such a plan takes longer than civilians anticipate, and this process can be stymied when presidents and their advisors are unable to provide the sort of detailed guidance that the military expects. Meanwhile, the president cannot determine the best guidance without first understanding the costs, risks, and benefits of each potential option. This chicken-and-egg dilemma is a perennial feature of civil-military decision-making. Although friction often frustrates civil-military relations, it is an inevitable and important part of the policymaking process. The system breaks down when there is too much friction or too little: when civilian and military leaders descend into open conflict or when one side acquiesces to the other and embraces groupthink. The system works best when both sides in the civil-military dialogue are able to speak candidly in an environment that fosters empathy and empowerment. In considering use-of-force decisions, presidents can no longer rely on the slow-moving gears of the traditional planning process. Neither can civilians remain ignorant of questions of manpower or logistics that lie at the heart of so many modern national security debates. 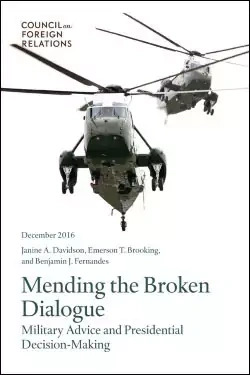 Through improved education, strong executive leadership, and changes to procedure and doctrine, the civil-military dialogue can be mended in order to confront new challenges to national security. Close the knowledge gap. Even high-level civilian officials may have had little prior exposure to military terminology, concepts, and basic planning assumptions. Civilian appointees should be offered regular opportunities to familiarize themselves with military parlance. Build an effective national security team. Senior civilian and military leaders should attend a group retreat during presidential transition. These officials should continue attending regular trainings after assuming their formal duties, participating in mock exercises that test their ability to work together. Set the tone of civil-military dialogue. A clearer distinction should be drawn between taskings (which are formal orders) and simple requests for information that need not always travel the official chain of command. Senior leaders should foster a permissive environment in which subordinate staff are encouraged to meet informally with their interagency counterparts, as well as collaborate on unorthodox ideas, even if such proposals stray from the party line. Redesign the military options process. Military planning doctrine should be revised to allow the rough, order-of-magnitude options. Interagency options development cells should be established across the national security system, as should dedicated options development cells within the Department of Defense. Facilitate interagency communications. Administrative barriers to collaboration, from lack of common email directories to redundant badge procedures, should be eliminated. Interagency partners should be ensured access to necessary classified communications systems. Plant the seeds of future change. Professional military education should no longer teach an idealized version of the civil-military dialogue, but the reality. Foreign Service officers should receive training in military affairs much earlier in their careers. Most ambitiously, courses regarding the nature of warfare and U.S. national security should be encouraged in civilian colleges and universities.